Video Luna the showjumping cow - Telegraph from Destini Ingoldsby on Vimeo. German teenager Regina Mayer asked her parents for a pony, when they refused Reginadecided the next best thing would be to train Luna, one of her family's cows. Although reluctant at first Luna now seems quite happy to jump the surprisingly high fences built for her on the family farm. Meyer said: "I still want to get a horse since it's just not the same. But I'll always be with Luna and do things with her. She'll stay my favorite." It's becoming more popular to use essential oils in livestock massage. The thought itself sounds a bit odd...livestock massage. Therapist are expressing the added soothing effects of using essential oils along with their massage techniques. Turns out... cows love getting massages! Giving regular massages to your cows helps keep the cow in a more relaxed state. This is great for beef cows because the meat is much more tender and it helps reduce birthing difficulty with pregnant cows! We've collected a few blends that are used by livestock massage therapist and have been proven to help relax cattle, from "Essential Oils To Calm Livestock". To make these essential oil blends you will need to put the same number of drops of each essential oil listed - for the blend that you choose, into a empty glass essential oils bottle - which you can get on Amazon. It's important for preserving the quality of the oil that you use either a blue or brown container and not clear. Ylang Ylang Essential Oil – encourages a calm state of mind and restores confidence. Frankincense Essential Oil – uplifts mood and brings feeling of relaxation. Valerian Essential Oil – calming and restorative effect on the central nervous system. Lavender Essential Oil – strong stress relief properties. Rosewood Essential Oil – establishes emotional stability. Spruce Essential Oil – brings on feeling of joy and helps release negative energy. Rose Otto Essential Oil – creates a sense of well being. Davana Essential Oil – eases feelings of stress and nervousness. Helichrysum Essential Oil – it’s sweet nectar smell helps to assist in releasing emotional blocks. Cedarwood Essential Oil – brings feelings of security and stability. White Fir Essential Oil – anchoring effect, relaxes the body whilst stimulating the mind. Pine Essential Oil – soothes muscles and joints. Angelica Root Essential Oil – provides a feeling of safety and security. Roman Chamomile Essential Oil– clears the mind and creates patience and peace. There are a few different applications for essential oils around cattle. Depending on the situation and the stress level of the animal, you may only have the last option. The best application for essential oils is to massage your preferred blend directly onto the animal. Mix 2-3 drops of your essential oil blend with a carrier oil of your choice, pour some of the diluted mix into your hand or a rag and then rub the animals muzzle. Rub into the poll, along the jawline and their ears. **Important*** Never use essential oils undiluted, aka "neat" - on you or your animals. Dilution ratio needs to be 12 drops of the essential oil blend to 1 fl oz of carrier oil. Carrier oils can be; extra virgin oil oil, fractioned coconut oil, jojoba oil or other similar oils. I like to make my diluted mix up in a dark spray bottle, this way I can store it in the bottle when not using it. If by chance the animal is too stressed to let you massage it. You can use this last option. Which is to diffuse the essential oil directly into the atmosphere around them. You can do this with a diffuser or hold out the bottle near the animals nose and let them waft in the scent as they want. If you don’t have a diffuser you can place some of the essential oils in a spray bottle with alittle water and spritz the air, walls or bedding. Or you can make a gunny sack scent dispenser. I'm sure you've seen them, typically they have cedar wood chips in them or pine needles in the winter time. You can make your own or buy one at most any local store in the scented candle idle. Once you have one you can then place 5-10 drops of your essential oil blend on the outside of the bag and hang it near where the animals beds. For first time essential oil buyers it is highly recommended that you read through this post first: "Things You Need To Know Before Buying Essential Oils" the website also goes over the best essential oils to buy. 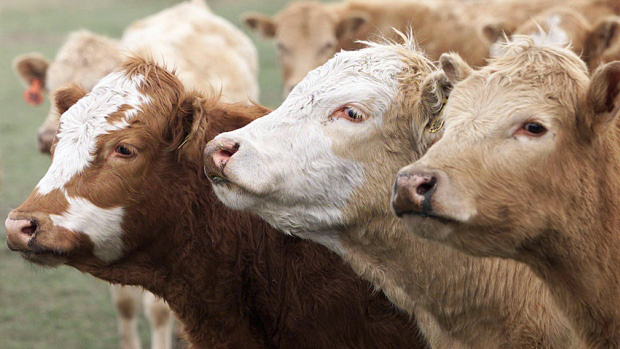 Pests such as flies, fleas and lice irritate cattle, raising their stress levels. Strongly scented essential oils such as rosemary, cedar, sassafras, pine, lavender, penny royal, camphor, anise and eucalyptus naturally repel pests and the stress they bring to the herd. Mix 1 part essential oil with 2 to 3 parts plain vegetable oil, and rub it throughout your cattle's coats, taking care to avoid getting it in their eyes. You can mix several essential oils to make your own blend, such as adding rosemary to lemon and peppermint oils to ward off fleas and mosquitoes. Cinnamon oil is known as a "hot" oil -- one that will make your skin feel like it's on fire when applied undiluted. When added to cattle feed, cinnamon oil helps reduce fermented protein in a bovine's rumen, which causes an increase in body temperature and greater susceptibility to heat stress. Feed cinnamon essential oil in capsule form, or diluted with olive oil and mixed into feed. Garlic oil, clove oil and oregano oil are other hot oils producing similar effects. Another cause of stress in cattle is digestive upset. Methane gases, formed as food breaks down in the rumen, can build up quickly enough to form a foamy substance. Normally, a cow would belch to release the gas, but foam blocks the cow from belching. The problem compounds as gases build up, leading to a serious condition known as bloat. Garlic essential oil contains diallyl disulfide proven to reduce methane gas production in the rumen by up to 70 percent. Essential oils can kill bacteria, fungi and some viruses, reducing discomfort and illness that cause cattle stress. In Europe, essential oils have replaced the use of antibiotics as feed additives to reduce stress and disease. Oils of thyme and oregano, which have anti-microbial, anti-fungal and anti-parasitic properties, are used, diluted, directly on skin lesions as well as internally. 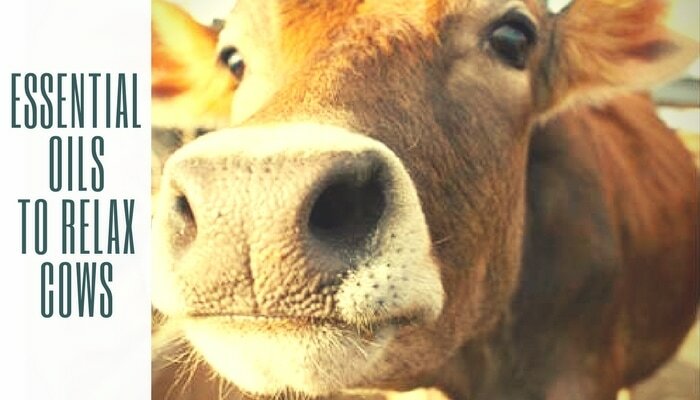 Massage mild relaxing oils like lavender and chamomile along the inner edges of a bovine's ears to help reduce anxiety. The article below is from Hobby Farm Blog. There are many ways you can keep your livestock happy during the worst of winter. By keeping them happy, they’re also more likely to be healthy and healthy animals produce more for your farm or ranch. Cattle often struggle to get enough water during the winter. Water sources can freeze or are impossible to get to because of snow, ice or mud. Veterinarians say that each day cattle need between 1 and 2 gallons of water per 100 pounds of weight. That makes water an important resource in any weather condition, winter or not. A novice livestock manager may assume that cattle can eat snow or lick ice to reach their normal limit, but that’s simply not the case. Doing so would take hours and reroute valuable body heat, leaving little time or energy to feed and grow. Since dehydrated cattle are more at risk for colic and impaction, it’s important to maintain their water uptake and keep them healthy. The easiest solution is to install tank heaters in their water sources. When you do, make sure to follow manufacturer instructions to avoid accidental shocks or fires. If you can’t use a heater, be able to provide unfrozen water several times a day and in multiple locations. By ensuring a regular water source, even when temperatures plummet below freezing, your cattle will continue to thrive — a key sign of a happy animal. Do cattle get cold? They do if they aren’t fed well enough! That’s why it’s important to maximize food delivery during cold weather. Without enough energy, they can’t generate enough body heat, their core temperature drops and death could follow. To keep your cattle well-fed and happy during the winter, there are a number of options. The easiest, but often most expensive option, is to switch to a feed with increased nutrients. These premium feeds deliver guaranteed nutrients, including fat and protein, but can wreak havoc on the profits of your operation. Another option is to find ways to feed cattle while limiting waste. Avoid scattering feed hay on the ground where as much as 50% of it can go to uneaten. Instead, deposit hay in a hay feeder or other similar shelter – just make sure there’s enough feeders for all your cattle to feed at once and without forcing any animal to wait its turn. Your best option pays off the most. Try to maintain a few fields of cold-hardy grass that your cattle can graze through the winter, even with snow on the ground. Early in the season, use rotational grazing to section off a paddock or two with your electric fencing. In it, grow a tall, highly-nutritious grass that will peak out from under a heavy snow. With the proper training on how to reach the partially buried grass, your cattle will be happy to spend a chilly winter day on the range. Life on the pasture is normally pretty good. Lots of food and plenty of space, but when a winter storm comes roaring in, getting to safety becomes top priority. Without it, cattle can stress over their well-being and panic. Providing proper shelter for grazing cattle during cold weather is critical and can even reduce your feed costs, since chilled livestock will have increased energy requirements. Shelter can be provided in a variety of ways. Three-sided sheds placed throughout your pastures will allow cattle to escape harsh weather. Hills, gullies, thickets of trees and shelterbelts can also work as wind breaks. It’s also important to pay attention to the weather forecast. 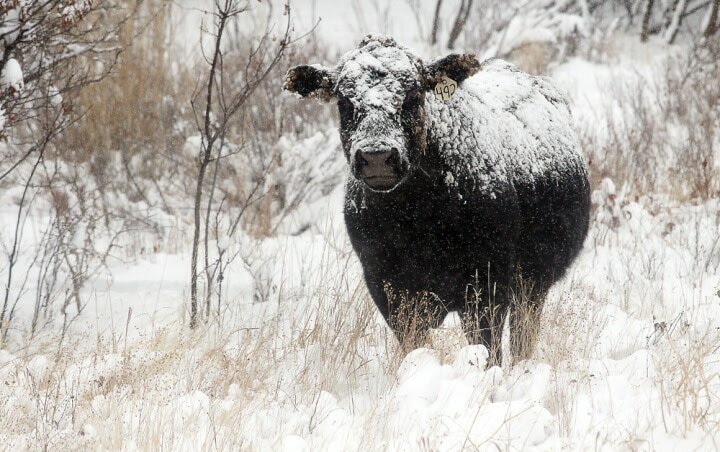 When you know there’s a winter storm coming, it’s best to keep cattle close to the barn or near a shelter. That’s one of the benefits of temporary electric fencing – you can control where your cattle are at all times. Winter mud hits cattle in two ways. First, mud is the perfect breeding ground for foot rot and thrush. Secondly, it can be challenging for cattle to stay warm when they are caked in mud, even if the mud is only on their legs. To keep cattle happy in the winter, address your mud issue by adding gravel or woodchips to muddy areas. You may also benefit from rotational grazing to limit the chances of an overgrazed pasture turning into mud. Your electric fencing can also be used to allow muddy fields an opportunity to recover. Pregnant cattle should be carefully monitored through the winter. Check with your veterinarian about any specific vaccinations they may need to keep them healthy through the winter, including nutritional supplements and deworming. Pay special attention to them through harsh weather, too. They need to be shielded from extreme temperatures and they have easy access to food and water, regardless of how deep the snow is. Remember a healthy, well-fed mother is going to pay big dividends later on. In fact, segregating pregnant cows into paddocks for close monitoring is always helpful. Doing so allows you to provide them with the right nutrition, water and shelter. Also, it keeps them close as they approach their due date. That allows you to be on scene and properly equipped to help during delivery. Beyond all the efforts listed above, there are additional ways to bring comfort to your cattle, winter time or not. Milking cows can be soothed and comforted with udder cream to relieve cracked and sore skin. Providing sand beds for resting cows helps ease stress on knees and hocks. Some ranchers have gone a step beyond sand beds, installing sloped water beds to ease body stress and increase comfort. Bedding material is also helpful, especially if cows are wet and its cold out. Another simple solution to increase comfort is to give your cows space – such as extra bed spaces and spaces for feeding. By keeping your herd size at the appropriate level for your capacity, your cattle will be far less stressed and produce better for you. Although it is true that Beefalo where breed for their incredible abilities to forage, maintain body temperature and sustain growth in sparsity... it is still a very smart idea to help aid your Beefalo's natural genetic abilities by doing the best that you can for your animal. A Happy Beefalo Is A Prosperous Beefalo! I recently saw this article posted by Art Einsky called "Why Cow Nappies, Udder Nonsense". I thought it was just another silly post, but when I started reading - I thought... this is ridiculous. So the short and long of it is... the European Union Environmental Laws has determined that cow poo; is too toxic to let it fall on the ground anymore and has set forth laws, yes laws -that require farmers to place "nappies" on their cows, while grazing them out in the fields. Apparently the law indicates this only has to be done if you are grazing cows on slopes with a 15% gradient or more. But in the Alpine farm region... this is a bit of a people. It's the mountains! Bavarian farmers are pretty upset about having to place nappies on their dairy cows and the Bavarian Farm Union have started to protest against the EU's new law. There are no commercial developed standard "nappies" yet, so farmers are just winging it. Most cows are handling the odd draping material around their rear pretty well. 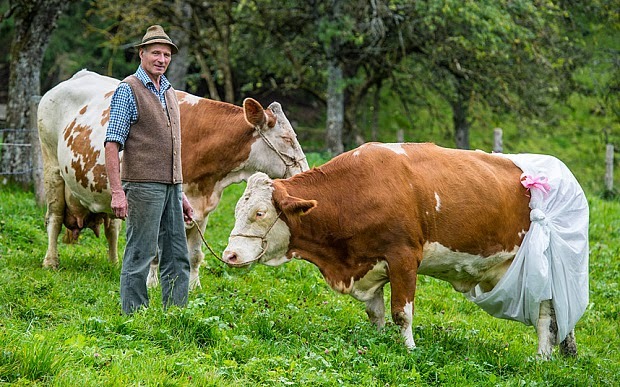 Johann Huber's family has owned their farm on the slopes of Gmund am Tergernese for over 400 years. Their cows have always happily fertilized their slopes. But with this new enactment Huber started placing his own homemade "nappies" on his cows to be on the side of caution. What do you think of this udder nonsense? Share your two cents in the comments below.. The earlier the better is the best method for halter breaking any calf. It's really important for them to get used to you touching them, so begin right at birth. It really helps if you have a cow that will allow you near her as well, because it will be in her nature to let you near her calf. So it is important to select Beefalo that you can work with easily from the start. Let us know if you have any tricks to halter breaking your calves in the comments below. If you are looking for Beefalo calves as 4-H students or for other show purposes, visit the "Beefalo For Sale" page for a list of current Beefalo calves for sale. One fine winter morning, all the cows were standing out in the barnyard. It was cold and windy, but the cows were in the leento off the barn out of the wind, and the sun was shinning brightly. Each cow was standing broad side to the sun, warming herself. “No I’m not, Madera,” she replied. Madera hung her head sadly. She always lost these arguments with Rosetta. All this time the other cows had been listening quietly. Just then old Grand Mom spoke; “There can be only one explanation for this,” she said. “I think the sun must have moved." With that all the cows moved around until they were again soaking up the warmth of the sun, and returned to contentedly chewing their cud. In what is know, known as a town charished tradition. 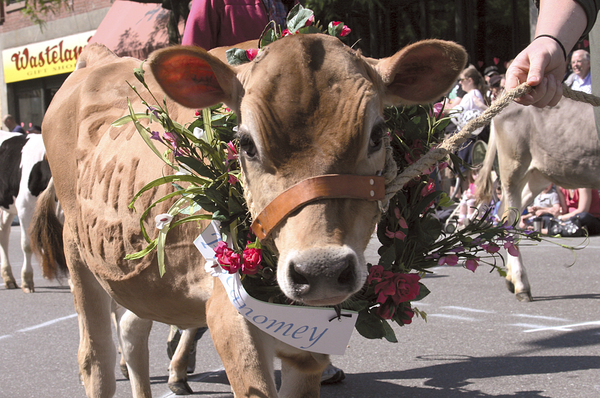 Last weekend; some 100 heifers, colorfully decorated with spring flowers strolled down main street in Brattleboro, VT. About 50,000 people (which) is half of Vermonts population, assembled 3 rows deep to show their support and appreciate for it's local farmers. This age old tradition was first started in 2002 where it took it's inspiration from Spain's "Running of the Bull". Vermonters where lamenting over the growing loss of dairy farmers. It was establish to bring attention to farming’s importance to the community’s health, heritage, and economy. Change, Not Always what We Hope For..
​"Shutting down was a hard decision, but the economics of running a small dairy (50 to 55 cows) no longer made sense as the price for milk barely keeps pace with increasing feed, seed, diesel, and fertilizer costs." There is a rise in demand for small niche farms, particularly artisan cheese markers. And if only for a day the uncertain future of Vermont farms floats away in the shouts of this happy parade. ​"Why Buy And Keep Register Cattle" & "Register That Bull". Many farmers feel it is not important to register their beefalo, making the comment: "If I want papers.. I'll get the Sunday Times". We may chuckle at this, but the sad reality is unfortunately the amount of financial loss and limitations for these farmers for not having "papers" on their beefalo. Note: We do not raise just any kind of cattle, we raise a unique hybrid with a long and proud history. Being able to distinguish our breed from just any ordinary beef cattle is a privilege, not an obligation. It is my desire that in sharing this article from other cattle farmers, that we can open our minds to the positive aspects of registering our beefalo. "I am often frustrated when browsing through facebook, it is apparent how passionate people are about their animals. So it continues to puzzle me why it is that so many people who appear to be passionate cattle breeders do not register nor buy registered animals. So the questions lingers in the air.. why should anyone buy registered cattle? Registration papers signify the genetic makeup of the animal you own or are about to buy. With one simple piece of paper you are able to trace that animals ancestry back at least 3 generations. Now why would this be important? Well perhaps we should explore for a brief second "what is a breeder?". The definition of a "breeder" is paramount and Wikipedia describes it as follows: "a breeder is a person or group that practices the vocation of mating carefully selected specimens of the same breed to reproduce specific, consistently replicable qualities and characteristics." So a breeder differs from one who simply "sells" or "keeps" a particular breed. A beefalo farmer or hobbiest should look at his/her operation as a business and whether the amount they raise is large or small.. everyone should strive to profit from their sales. "Let's look at a small example to help clarify this aspect; Trying to duplicate a particular animal by pulling the same ancestors out of the similar pedigrees. This is a common practice among breeders within their herd. When we recognize a superior animal out of one cow sired by a particular bull, we may try to reproduce some of that superior creature by repeating the breeding. Sometimes it works.. other times it fails. That is the fun and frustration of breeding livestock, we get to see what we can accomplish and hopefully learn from our mistakes. In your own herd, your memory or careful note taking rekolect such successes or failures. A purchaser of registered animals now has that same map to success when buying new breeding stock. Let's transition back for a moment to the breeding aspect as we grab a tid bit from the "Register Those Bulls" article. "Genetic knowledge is critical to the future of the beef business. Without trying to upset anyone, bull circles encompass a lot of discussion, which is good. However, generally, if the breeder has done his or her homework, every bull has been registered and the genes that are available are known. Registration numbers are a pathway to the genetic offering through the various breed associations. Recently, I have been busy assisting producers at bull-buying workshops. These workshops seem to be appreciated as producers develop baseline or benchmark values for production traits of previous bulls utilized in the herd. Too often, the stumbling block is the lack of a registration number, which blocks access to the database that contains the bull’s information. Do not make the statement: “Well, the bull only will be used on commercial cows, so I do not need the bull registered.” That is wrong, just wrong. The biggest toe-stubbing problem in the beef industry is the lack of understanding of the value of individual animal identification. "Breeding registered cattle is highly rewarding both emotionally and financially. But buy registered cattle is not enough to creating the best, you must learn to study these registration papers and develop a feel for what a "A+" cow or bull is, if you want those papers to pay off. You need to develop the best you possibly can and market those genetics in any fashion that you can fathom. It means you breed reliable cattle that does what you expect, what your consumers expect and desire. You build a reputation for honesty, integrity and good cattle all at the same time. You back your word with deeds and make sure you take care of your buyers. Help them learn, help them market, help them become ennamered with registered cattle as you are. It's not rocket science, but it goes a long way to cementing a relationship between you and your new buyer and a relationship between that new buyer and your association. Make registration your priority and instill that precident in every purchaser of your cattle. It takes a long time to build a respected reputation that new breeders will turn to as first choice for new purchase options or herd improvements. So do those registration papers really matter??? The answer is an unequivocal... YES! Anyone with cattle can market those animals for beef. And any registered cattle can produce beef, but opposite is not true. An unregistered animal is grade/commercial cattle; no matter how gorgeous, no matter the breed, no matter the confirmation or the temperament, and no matter how "pure" they may look it remains the same... beef. KLM Farm brought the following 4 Beefalo to Fryeburg Fair this year; KLM Ranger, KLM Black Label, KLM Teaberry, and KLM Cherry Blossom. They had a good showing with KLM Ranger winning Sr. Champion Bull for A.O.B. KLM Smokey is out on loan to Walter Wormwood in Wells, Maine to breed his Angus cows. We are looking forward to their next years calves. We still have a bull calf available for a 4-H'er as a steer project. Here I am w/KLM Ranger who was the winning Sr. Champion Bull for A.O.B. The 3rd picture this was take at Acton Fair Ken and I with KLM Ranger where he was Grand Champion bull, KLM Olive was Champion Female and won a silver plate. This has been a full year for us, we started the fall season with a wild rodeo of a herd check. The whole gang of grandchildren, spouses and friends Kelly & Rick helped us roundup each group. We had to play a bit of musical corrals, in order to get everyone in for their shots, dehorning, wormer, tattoos, snips and pregnancy checks. We were grateful no one got hurt (people that is, can’t say much for the once young bulls). We are also proud to announce that our stud muffins; grand sire “Smokey Quartz” and first year sires - junior bulls “Bart” & “Biki” are doing a great job, we should expect a good bunch of little ones arriving this spring! “Biki” is enjoying a new entourage of beefalo gals this fall, winter and spring. He is being leased by Tim & Blake Gowen – Tamarack Farm until June of 2016, at which time he will again be up for sale or another lease agreement. We have added several new registered full-blooded heifers with high bison marker verification to our breeding program this year, we are excited to see the color variation in future offspring that these new girls will bring. Did you ever stop to think how fortunate we small farm beefalo farmers are over large farms and ranches? It’s possible to know all our animals as individuals. They often are not just numbers but will have names, and memorable personalities. For instance, has anyone ever had a Hildegard? Our Hildegard is the matriarch of our herd. She is the oldest, the largest, and always out front. She doesn’t need to be bossy because she is the boss. A little turn of her head left or right, or a short step forward tells the other beefalo her wishes. She always gets the most and best hay by checking each bale and keeping the best for herself. When we first got Hildegard we didn’t know she could tell time. We had always run our lives quite leisurely, sleeping late on the weekends and often working on a chore until dusk. She wanted to be fed Hildegard time. Early was OK, but don’t be late! She would just “hop” over the electric fence to munch on the lawn or a cabbage or broccoli plant. She would go right back when the hay was served. It was her way of putting us on her schedule. Hildegard doesn’t like to be touched or fused with. Strangers upset her. Imagine her anxiety when it was her turn to go through the chute at roundup time in the fall. The corral is six feet high, the gate five and a half feet. Hildegard cleared the top of the gate. It was quite a sight to see a huge animal like her jump that high. We just figured that was it for her fall work that year. But she has a weakness for grain, and knew there was a pail of grain in the chute. Back into the corral she went, down the chute for her share of grain, and then was caught to get her shots and a pregnancy check too. Dr. Leahy the veterinarian had the most amazed look on his face. Beefalo At The NH Farm & Forest Expo! For the first time ever, North Eastern Beefalo Association is going to have their own booth at the NH Farm & Forest Expo! The North Eastern Beefalo Association is proud to announce that they will be hosting their very first booth at the NH Farm & Forest 33rd Annual Expo. The NH Farm & Forest Expo is said to be winter's greatest fair and is held on January 22nd & 23rd. Their will be fun things for the whole family to enjoy, so why not make a day of it! Friday, January 22 9 a.m. to 8 p.m.
Saturday, January 23 9:30 a.m. to 4:30 p.m. The booth will have posters and pamphlets about the benefits of raising Beefalo and how to start a herd. As well as sample registration forms from the American Beefalo Association, business cards, photos and farm credits. Stop by the booth to talk face to face with a few of New England's Beefalo farmers!